WARNING: The following article contains spoilers for Arrow Season 7, Episode 6 titled “Due Process.” Please do not read if you have not seen the episode or read ahead at your own risk. Felicity Smoak (Emily Bett Rickards) crossed even more lines in this week’s Arrow and it foreshadowed her turn to the dark side. 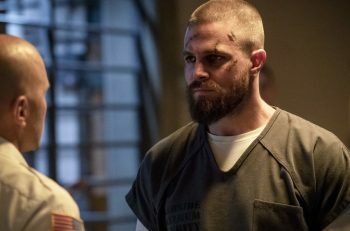 We found out this week that Diaz (Kirk Acevedo) murdered his entire gang and plans to destroy Star City – as revenge on Oliver (Stephen Amell) – by using a powerful weapon to send toxic gas through the city’s pipes from the power plant. Felicity tasks Anatoly with copying the hard drive of an old KGB friend who is working with Diaz. The “friend” knew Anatoly was coming and nearly beat him to death until Diggle (David Ramsey) saved him, despite Felicity’s protests that she needed the intel. “I hope when this war is over, you still come out a hero,” he said. Team Arrow (minus Oliver and Curtis) finally gets back in the field as Diggle, Dinah and Rene work together to finally capture Diaz and foil his plot to destroy Star City, at least for now. Felicity texts evil-turned-kinda-good Laurel and tells her they got Diaz. Just as Felicity is about to shoot him dead, Laurel stops her, saying she made a deal with the feds to trade Diaz for Oliver. “Oliver’s coming home? !” Felicity says. So, how does all this pertain to the future where Felicity is allegedly dead? Let’s get to that flashforward. Dinah explains to William that Felicity was murdered a few weeks before he and Roy got to Star City. She had started to move in ‘dangerous circles’ and took on the name The Calculator. William is also determined to learn why he was summoned in the first place. Roy and Zoe reconnect while searching Smoak Technologies. Dinah asks what brought them back to Star City and Roy says there was a “Mark of Four” on the inside of Oliver’s bow, which Dinah finds impossible. She goes on to tell Roy she isn’t sure they can trust William because he is Oliver’s son. That’s a very interesting point. Is she implying that future-Oliver turned evil? Either way, I am excited to see where this leads. In this week’s prison storyline, the new guard, Dunbar, has been murdered. Stan is put in the hole as the suspect but Oliver uncovers a blade that belongs to Turner aka Bronze Tiger. He thinks Turner killed the guard and Stan is released. However, upon his return, Stan slips and says if Oliver hadn’t found Turner’s blade, he’d still be in the hole. Oliver questions how he knew whose blade it was and Stan said he heard it from someone. You can see the look on Olly’s face. He knows he can’t trust Stan now. Anyone else loving evil-turned-good-but-still-evil Laurel? Arrow airs Monday’s at 8/7c on The CW.